Friday 6th June 2014. What a contrast to yesterday, we awoke to wall to wall blue sky. Looked like the forecast was right! Jolly good breakfast at the Wasdale Head Hotel, just what we needed before a big day on the hills. There were name plates on the tables and next to us was Mr C Limer, quite apt for such an important climbing area! I took some drugs before leaving and wore my back support to help my back. Splitting the load by carrying my camera on the front and rucsac on my back helped enormously compared to yesterday when I carried everything in my rucsac. We were on our way by 9am heading for Great Gable. There are some waterfalls that I have wanted to photograph for several years and today was the day! 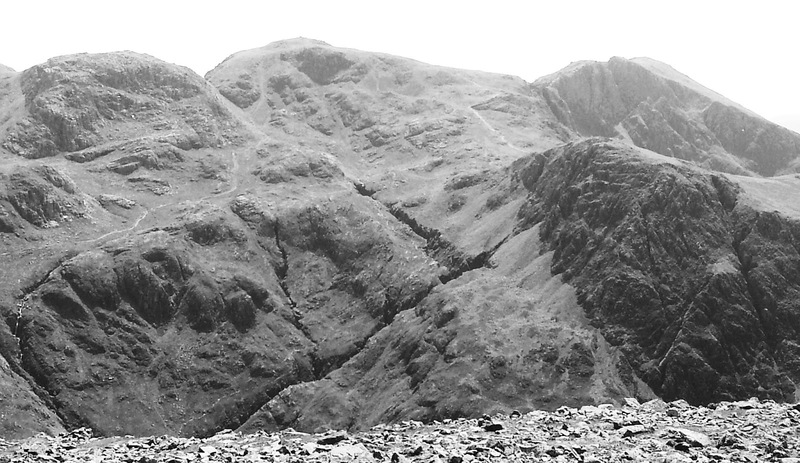 They were a few hundred yards below the track between Great Gable and Kirk Fell. Close up they look very impressive, wide and about 50 feet high. It was a jolly steep grassy slope down to them so I definitely won’t be using them as a location on our Lakes photo courses! I used a long shutter speed of 0.5 and 1 second to make the water streaky. Should be good. We followed the track for quite a way before boredom set in and we made our own way across the hillside. It was steep with lots of loose rock to make it harder. The main challenge on the way up was a long wide gully of scree and boulders a few hundred yards from Napes Needle. I spotted a shapely rock and headed across to see if it looked better close to, it didn’t. Al stayed on the other side, just as well as he seemed to be swearing about me and my choice of route. Some people are just so ungrateful, it was a really quiet route up! He soon crossed the scree to join me and it looked like he was up to his knees in scree, then I realised he was kneeling on the slope not part buried. What a relief, I was worried what digging him out would do to my bad back! Jolly good views above the gully. I was using Ilford SFX infrared film for some dramatic effects, as well as Ilford FP4 of course. Watched a rescue helicopter lift someone off the top close to Scafell Pike. So many people on Great Gable, pleased I took my photos from the top before the place was overrun. 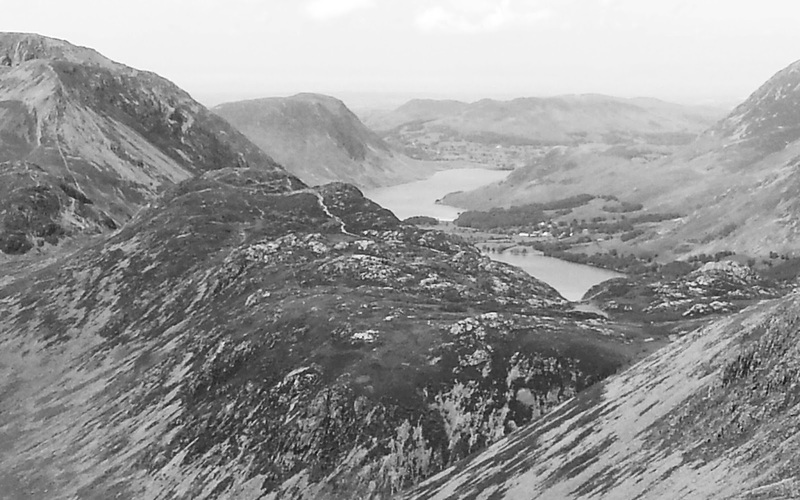 Onwards to Green Gable and a spectacular view to Buttermere and Ennerdale. Nice light too but a bit of haze so I used my new light red filter to cut through it. Fingers crossed it does the job. It was now just 3.5 miles and 6 hours since we started, not exactly rushing. We ended with a tricky walk down to Seathwaite past some spectacular waterfalls in Sour Milk Gill then an easy walk to Stonethwaite. We were in a b&b near the pub and we headed straight for……..the pub! 4 real ales on and all on good form. Can’t remember the rest of the evening. Tomorrow we walk to Keswick along the Cat Bells ridge, thunderstorms permitting. 8.5 miles, nearly 5000 feet of ascent, 8 hours, lots of stops.